Who are the most popular players with the top AFL Fantasy coaches? Eric Magtuto, coach of Team Ricontop, crunches the numbers in an epic read that is sure to help you get the edge! I was listening to the latest AFL Fantasy podcast from The Traders and the boys talked about Hall and wondered how many coaches in the top 1000 held onto Hall? I thought that would be interesting to know, not the top 1000 but the top 200. Seeing that I’m ranked 386 (Team Ricontop), I want to know what is in front of me. Well minutes turned into hours and after looking at my monitor for a whole day, I had the answer to the question “How do I compare with the top 200 AFL Fantasy Coaches?”. These six players represent the most common defenders in the top 200. Heath Shaw is represented in 92% of the top 200 teams. This is quite amazing considering that the “Reverse Trade” is in general accredited to “Headache Heath”. If Heath Scores low, be assured that your ranking in the top 200 will not be affected! Everyone else has him! There is a big gap between Boyd and the next player down the list (Bartel – represented in 19% of the Top 200 coaches). If you don’t want to be “Vanilla”, and “hey I want to go up in rankings”, there are some amazing players that are under-represented in the top 200 of coaches. Just stay away from Fantasia! One coach in the top 200 has him. I like the two players below. These nine players represent the most common midfielders in the top 200. Where there used to be the ABC (Ablett, Bartel and Corey) now we have Rocky, Danger, Hunter and Ablett. 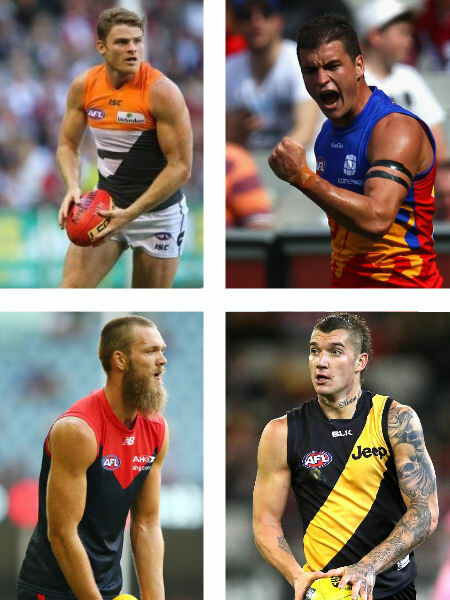 These four players are so common in the Top 200 AFL Fantasy team. Very surprising that Jordan Lewis makes it in list of the most popular players in the top 200. Outside these 9 midfielders, the next player down the list is Mitch Duncan, represented in 23% of the Top 200 coaches. There are also 45 coaches (23%) in the top 200 that are left wondering what to do with Zaharakis. Again be unique and use Calvin’s Scale of Hardness to go up the ranking. I like the two players below. I anticipate that Sloane will be one of the most traded players this round. If you want to be really unique, why not Curnow? That’s right, Ed Curnow! If you listened to the podcast, both Calvin and Roy were keen. Are you ready to jump on the Curnow train? Now there’s a revelation, not Gawn but Martin the most selected number 2 ruck. Goldstein (26%), Jacobs (19%) and Blicavs (12%) make the bulk of the most popular rucks in the top 200. Nothing to see here, Get Gawn get another ruck! These seven players represent the most common forwards in the top 200 teams. No surprise that Martin and Zach Merrett are the most common forwards given their form! What is surprising is that Riewoldt is only in 20% of the top 200 teams just behind Franklin (22%). Worth noting is that 34% of coaches in the top 200 held onto Aaron Hall. On another note, once you have upgraded all your players, you should make it a priority to upgrade Kerridge, he is still owned by 69% of the top 200 coaches (Reverse POD). There are 11 percent of coaches that have held onto Barlow and Wells. This tactic could work if both are named this week! The percentage breakdown as you approach the top 100 and top 50 is similar to the top 200 list for all positions. There are minor differences but this is unremarkable. A full list of players and their % representation can be found on the excel spreadsheet. Have fun, be unique, use Calvin’s Scale of Hardness and go up the rankings! I’m dreaming back in the 1900’s, but this is outstanding information. May as well go smoky for a few trades and see what happens. I’m 192 going into Round 16…Thanks for the info, gives me a few pointers if I want to roll the dice and try to make up the ridiculous 800 point gap between me and the top team. Hmm, perhaps I’ll just focus on my league wins. With the exception of McGovern, all of my 22 appear in the top 200 list somewhere. Only 12 of them are in the ‘top’ boxes though. Defence is pretty much sorted – Shaw, Laird, Simpson, Docherty, Boyd and McVeigh. Have Rocky, Danger, Titch and Parker from the top 9 box, Smitch and Thommo are good to stay, Blics and Kerridge kinda got shuffled in there at some point. Happy with Martin and Jacobs in the ruck from here. Forward line needs some work – Montagna, Wells, JJK, Wingard, Menzel and McGov. Interesting though, if you assume ownership of each is an independent ‘event’, less than 3% of the top 200 would own all six of the top defenders. FWIW I’m ranked 13977 in AF. Wow. One of the better articles this year. Appreciate your efforts. I’m outside the top 200 now with too much ground to make up now (too many sideways trades covering injuries and chasing points!) Grundy’s low ownership still baffles need. Great R2 to big Max and one of my first picked next year. My favorite article this year, great timing with the byes done and a really clear picture of how you need to trade to move up the rankings. This is a sweet article… gracias amigos! Thanks a lot mate, very good information, and no doubt took a lot of time to do! Upgrading Zaha; Parker or Curnow? Interested in Curnow as a POD and he’s been consistent, although Parker may go bang for the rest of the season. Thoughts anyone? Interesting to see Naitanui is in a couple of those teams. Thanks Gorrilas. Yeah Nic Nat, I’m sure that’s their next move after the bye. The best article I’ve ever read on DTT. Would be interesting to see how this changes through the year. Can your skills be applied for the election result? 18 players in the top boxes, blics and goldie instead of gawn and martin and I’m ranked 2900. How to fantasy? best article. was 30 a couple rounds back and dropped back to 230ish after last round unfortunately. my last round was putrid. realistically, what position can you be in and still have a shot at winning it? are you still a shot in the top 200 or are you dreaming even if your’e top 50? This is brilliant. First comment on an article all year just coz of how genuinely useful this is. Keep up the good work! Cheers Jim. Appreciate the feedback. There could be version 2 leading up to the finals. Absolutely ripping article @magtuto! Very interesting read!